In making Nigeria a hub and destination of investors from all parts of the world, FOW Word have partnered Nigerian Embassies in China, Japan and Korea; Small and Medium Enterprises Development Agency of Nigeria SMEDAN and Federal Ministry of Trade, Industry and Investment in packaging Nigeria/Korea/China/Japan Business, Investment and Trade Exchange Expo Convention and Summit tagged World BITE Expo 2017. 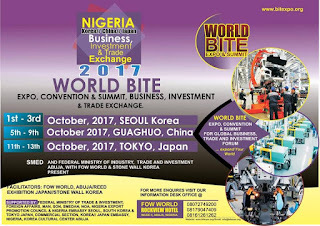 The World Business Investment and Trade Expo, Convention & Summit (BITE-EXPO) which has now gotten the backing of the Federal Government of Nigeria as well as other international agencies, will be a global business window for investors from around the world to see beyond their country and take advantage of investment opportunities in others. Partnering agencies with experts in global business development and promotions like SMEDAN, Federal Ministry of Trade, Industry and Investment on the project, the President of FOW World, Hon. Nwabueze Buchi George again reassured prospective participants that the event will yield unimaginable results. “Aside the extra international trade relationships it will be offering both local and international investors, it will afford those willing to expand their businesses on a global scale the opportunity to know the right direction to head. “Old and new businesses stand a chance to exchange ideas, goods, services and this is just a platform to build a new business world for today and the future” Hon. 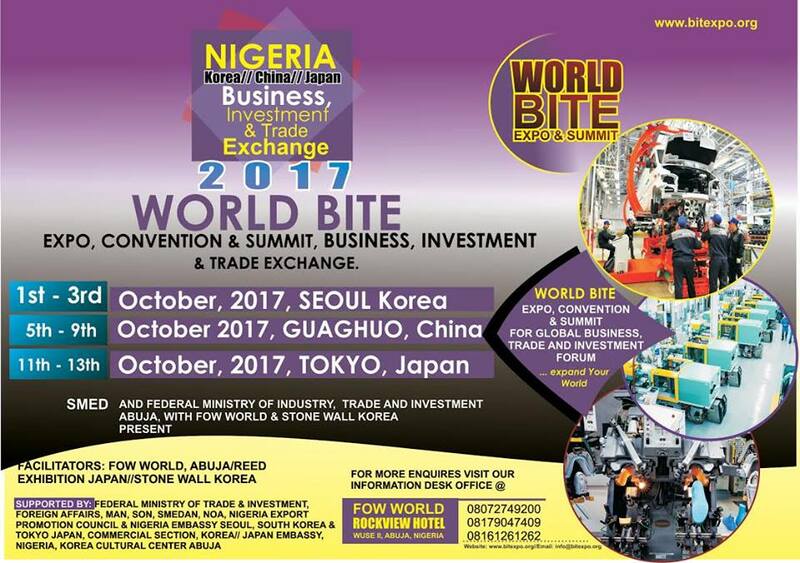 Buchi George said, adding that more than 5000 participants are expected at the event in the three Asian countries it will be taking place. A release on the official website of the event, www.bitexpo.org, has it that the event will be taking place in China, Japan and South Korea, kicking off in Seoul, South Korea from 1st – 3rd October, 2017, while the next stop will be in Guangzhou, China from 5th – 8th October, 2017 and then Tokyo, Japan from 11th – 13th October, 2017.